HMS Investigator, abandoned in the Arctic 155 years ago during a search for Sir John Franklin’s expedition, has been found. 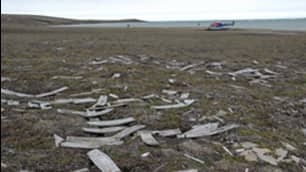 Parks Canada archeologists looking for the ship found it 15 minutes after they started a sonar scan of Banks Island’s Mercy Bay in the Northwest Territories, said Marc-André Bernier, chief of Parks Canada’s underwater archeology service. “After 15 minutes, they basically had an image of the wreck,” Bernier said. 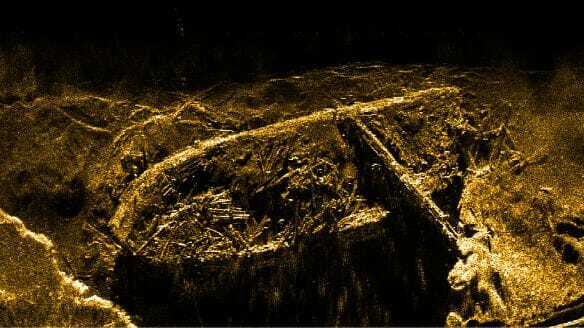 The ship is upright in about 11 metres of water, its bottom buried in sediment if it’s still there, and the upper deck under about eight metres of water. “Apparently, you can see some of it from the surface when the water is clear,” Bernier said. “This is very cold water. That helps preservation as well,” he said. Before departing to go to another ship, the crew of HMS Investigator buried their cargo on Banks Island. Remains of the barrels indicate the cache’s location. (Courtesy of Western News)“The work really starts now for the archeologists,” Bernier said. The ship hadn’t been found earlier because of the difficulty involved in getting access to the area and surveying the bottom of the bay, which is usually covered with ice, Bernier said. 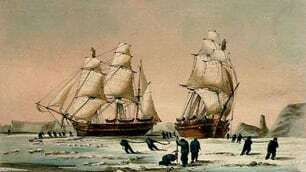 The ship was stuck in the ice for more than two years before it was abandoned, he noted. The Investigator, captained by Robert McClure, was sent in 1850 to search for Franklin’s crew and their two ships, the Erebus and Terror. “This is the ship that confirmed and nailed the existence of that passage,” Bernier said. “This is alive in the Inuvialuit memory today,” Bernier said. The Investigator site “had a major impact” on the Inuit because it was a source of copper and iron, he said. In fact, the pieces of the small boat found on shore should have metal nails in it, but they have all been removed. 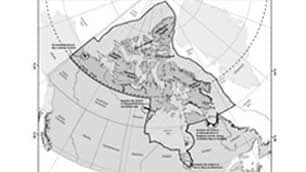 “It was a resource site for the Inuit,” Bernier said. Franklin’s party disappeared while searching for the Northwest Passage in 1848, following their captain’s death partway through the expedition. Their ships haven’t been found, despite numerous searches. Parks Canada is planning another search for the Erebus and Terror in August. The Norwegian observatiion satellite AISSat-1 was successfully launched from Sriharikota, India on Monday. The satellite will greatly improve surveillance of maritime activities in the High North. As we reported earlier, this is the first Norwegian satellite developed in Norway. The AIS (Automatic Identification System) is a short range coastal traffic system used by ships and Vessel Traffic Services around the world. AIS is required to be fitted on every seagoing vessel of 300 gross tons or more. Its purpose is to help ship crews to avoid collision with other vessels as well as to allow maritime authorities to track and monitor ship movements. AISSat-1 will operate in a polar orbit at an altitude of 600 km.The Norwegian Space Centre is project owner. The Norwegian Coastal Administration will receive the data and the Norwegian Defence Research Establishment (FFI) is responsible for the technical implementation. The total cost of the satellite is approximately NOK 30 million. The two Murmansk registered oil tankers Varzuga and Indiga are right now on their way through the partly ice-covered Northern Sea Route on their way to Chukotka in Russia’s Far East. The Arctic shipping season 2010 is closely followed by the world’s shipping interests as global warming makes the sea ice retreat in record speed. By sailing the Northern Sea route, the ship-owners save both time and fuel-costs as the distance from Europe to Asia via the north is much shorter than traditionally routes through the Suez- Panama-, or around Africa to Asia. The two oil tankers that left Murmansk this week are accompanied by an icebreaker, reports MBNews. The tankers hold the ice-classification 1A Super with double hull according to the web-portal of Murmansk Shipping Company. The tankers are loaded with 27,000 tons of petroleum. They are scheduled to arrive in the port-town of Pevek on Chukotka in Russia’s Far East on July 27th. Although Varzuga and Indiga are the first tankers to sail the North East Passage this summer, they are not the only. Russia’s biggest shipping company, Sovkomflot, intends to carry out a first major oil shipment from the Varandey terminal on the coast of the Pechora Sea through the North East Passage to Japan later this summer. Sovcomflot will send one of its purpose-built 70.000 dwt ice-classed shuttle tankers on the route. If successful, the tanker will be the first ever oil tanker to sail the entire Northern Sea Route from Northwest Russia to Asia. The world’s largest group of shipping companies has told the Canadian government its new moves to assert control of the Northwest Passage might violate international law. The Baltic and International Maritime Council, whose members control two-thirds of global shipping tonnage, has objected to rules that force commercial ships to register with the Canadian Coast Guard if they sail into the Passage. The council says that rule could conflict with the right of innocent passage for shippers. The council also says Canada’s decision to extend environmental protection to waters 200 kilometres from the coast is “drastic” and not needed. The U.S. has also expressed reservations about the new rules, which came into effect on July 1. Few countries agree that the Passage is Canadian. Russia may abandon its polar drifting scientific stations in the Arctic region within five years and build a special permanent platform for replacement, the Interfax news agency reported on Friday. The final decision on the replacement has not been made yet, but the idea “is being discussed actively,” head of high-latitude expedition of the Arctic and Antarctic Institute, Vladimir Sokolov, said, Xinhua reported. The institute had spent all the money allocated for 2010 for the emergency evacuation of the SP-37 drift station after the ice floe it stands on had been broken, he said. “So this year the next station, SP-38, will not likely be planted, we are just short of funds for that,” Sokolov added. According to the scientist, service fees for the nuclear ice-breakers rose 10-fold during the last six years and the next polar station could be launched only if the extra state funds would be allocated. Russia set up annual polar expedition before World War II and kept them going even during the Great Patriotic War. The polar drift stations’ crews consist of meteorologists, oceanographists and other scientists. 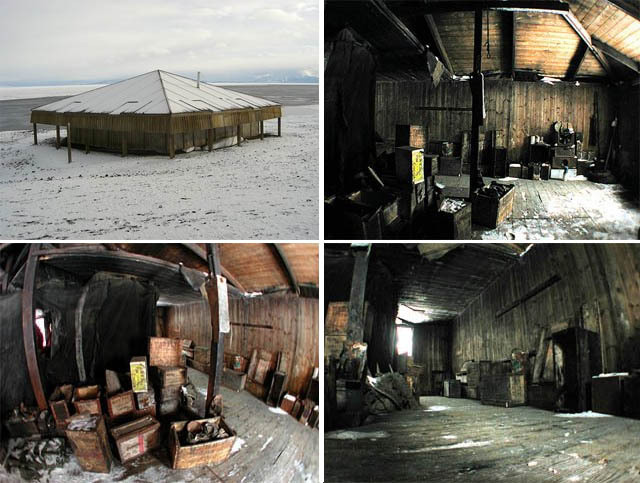 This weblog has some nice pictures of abandoned stations in Antarctica, including exterior and interior shots of Scotts cabin as it still stands today.